Disregarding ecological and livelihood concerns, the Parbati hydroelectric project in Himachal Pradesh is moving forward. 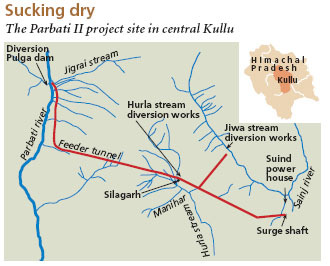 Experts warn that diverting water from the Parbati and its tributaries for power generation will leave the people in Kullu, where the project is coming up, with nothing to drink and irrigate their fields. The problem is that the project, being set up by the National Hydroelectric Power Corporation (nhpc), was approved eight years ago on the basis of data for water flow in the Parbati and its tributaries between 1969 and 1998. Since then the water the tributaries receive has decreased due to the shrinking of glaciers. Experts say that tapping these small streams will hardly enhance power generation; instead it will create severe water crisis. The 2,000-mw hydroelectric project consists of three segments; two are under construction, at Silagarh, 18 km from the Kullu airport, and at Sainj in Sainj valley (see box Changing course). It is the second segment which is causing the worries. People of four valleys--Hurla, Garsa, Sainj and Manihar--say the Parbati ii scheme is imperilling the valleys. nhpc says 15 per cent of the water in the Parbati will be available to the public after diversion. But many say this will not be sufficient. They have reasons to be sceptical. Earlier, the Parbati used to face one lean season in a year. A state-commissioned study by the Delhi-based consultant inrm Technology House found last year that the river now has two lean seasons because of the shrinking of glaciers in the Himalayas. The project diverts water from the Parbati at Pulga village in Parbati valley. At Silagarh, water from the Manihar, Pancha and Hurla streams, originating in the mountains at altitudes below 4,000 m, will be added to this water. When the snow melts early due to unprecedented heat, it causes a retreat of the permanent snowline. As a result, snow-fed streams get less water by the end of summer. In 2004, the state environment impact assessment and monitoring committee had sought a study on the second phase of the project. 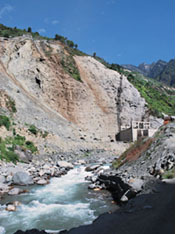 The consultant, inrm, recommended in January 2006 that the water from the Parbati's tributaries should not be diverted. It also said blocking the streams will not boost power production significantly; instead it will lead to a serious water crisis. "The permanent snowline, which was 3,500 m above in the mid-1990s, is at 4,200 m now. This affects rivers which originate below 4,000 m," says Pratap Chandnani, a consultant with inrm. He adds that if the streams are diverted, there will be nothing left for the valleys. In May and June when vegetable cultivation is intensive in the region, there will be a water crisis. These fears are reinforced by scientific studies. A paper published in Current Science on June 10, 2005, confirmed the retreat of the Parbati glacier by 578 m between 1990 and 2001. Another paper in Current Science (January 10, 2007) recorded a 22 per cent glacial loss in the region between 1962 and 2004. "Patches of snow, which were permanent, have withdrawn at a fast rate," says Anil V Kulkarni of the Indian Space Research Organisation, the lead author of the paper. "It affects the place's hydrology. There will be a problem of distribution of water over time," warns A K Gosain, hydrologist at iit Delhi. nhpc agrees that the flow in the streams in the region has "reduced considerably" in the past three years, but claims they still have sufficient water during rainy season. "The combined flow of the Manihar, Pancha and Hurla streams is significant during the lean season when inflow in the Parbati itself gets reduced," says an nhpc official. In January 2006, inrm wrote to the principal secretary of the State Council for Science, Technology and Environment (scste) "This is a classic case where a large project conceived and approved years ago and now under construction would end up not only destroying the ecosystem of wide valleys by diverting even their smaller streams, but would also have adverse impact on the livelihood of locals, especially agriculturists." In March, 2007, the Himachal Pradesh State Environment Protection and Pollution Control Board asked scste to consider inrm's recommendations. A month later, the environment cell of the state electricity board informed scste's environment planning unit that the diversion would affect people's livelihood and the gains in terms of power generation would be meagre. The suggestions have not been taken seriously. nhpc is going ahead with the project. Even before the diversion of the river water begins, the people in the valleys are facing another problem mud excavated during the digging of tunnels being dumped in streams. Officials of the new pollution control board (pcb) admit 60 per cent of the mud near the Jigrai stream in Manikaran, 45 km northeast of Kullu, had gone into the stream. "There is very little flow in most streams in Railla village in Sainj," says pradhan Room Singh. "The soil is very dry and the temperature high, so apple production has reduced," adds Sainj resident Tharvan Pal Sra. Last year, pcb found mud near the Pulia stream in Garsa valley. The pcb office at Kullu denies any problem. "There are absolutely no problems with Parbati ii. We have received no complaints. We are regularly monitoring the water and air of the place and have found nothing wrong," says Chetan Joshi, in-charge of pcb. Lok Vigyan Kendra, an ngo in the region, complained to Joshi in August 2007 against releasing untreated water into streams but to no avail. A classic case of bureaucratic apathy.